Despite being in operation since 1803 the Germany's number one brewery “Krombacher” is not stuck in a time warp as illustrated by its cutting edge visitor centre where the centrepiece is a unique back-lit floor projection system. Visitors to the centre are able to walk across a floor of moving images that are projected from below ground. This is achieved using Panasonic projectors housed in a room that has been dug out of the ground specifically for the visual installation. This imagery forms a key part of the visitor centre that was radically overhauled at a cost of Euros 2.5 million ahead of its official re-opening in November 2006. The refurbishment involved extending the existing building to double its square footage, and incorporating a myriad of state of the art visual equipment. Situated in the main hall, the floor projection system comprises four PT-D5500 DLP single-chip projectors that are located in the 1.5m deep purpose-built room which is covered with strengthened glass. These projectors show four separate video sequences (each controlled by PC-based hard disc players synchronised by an external control unit) that combine to make up a single total image across the whole of the 4m by 3m dimensions of glass screen. The brewery was keen to have the imagery projected onto the floor in this way as it effectively created an island onto which they could highlight the company’s natural brewing processes and its close links with the environment whilst also allowing people to walk over the images without them being obscured. This link is particularly important to the brewery as it regards the soft spring water, which is low in minerals, as the basis on which the success of its Pilsener beer has been built. This underground projection arrangement represented a major project by the marketing agency Videograph GmbH employed to create the new centre, and the consultant tasked with delivering its audio visual aspects. At the initial stages the consultant was unsure whether suitably strong glass could be sourced and if a sufficiently clear image could then be projected onto its surface. Employing some innovative thinking a solution was devised that involved sandwiching a semi-transparent acrylic screen, which would show the image, between a sheet of strong glass (comprising three panes of 12mm thick glass) and another glass plate that could easily be replaced when scratched from visitors’ footwear. Another issue the consultant faced was to devise a cooling system for the projectors in such an environment, especially when the equipment would typically be operating from 9am to 5pm five days per week in addition to possible extra usage during internal brewery events. The choice of Panasonic DLP projectors with liquid-cooling helped overcome this problem as they are able to operate in critical environments. Their sealed nature also helps to keep the dust out from the optical components, thereby reducing the need for maintenance, which was another requirement of the brewery in order to reduce ongoing running costs and any potential downtime. Panasonic was also chosen as the supplier of the visitor centre’s ceiling-mounted projector that delivers an image approximately 7m across within a cinema-style environment positioned on the perimeter of the main hall, which can be curtained off. The PT-D7700 3-chip DLP projector is used to show a three minute video of the history of the brewery and highlight its various products. The video footage complements the other visual attractions within the centre that are housed within stylish ‘waveshaped’ cabinets. These contain information on the ingredients used within the various Krombacher brews, details of the brewing process and displays of the brewery’s diverse product range. In addition, a number of interactive touchscreens enable visitors to view the company’s numerous television commercials and product information. 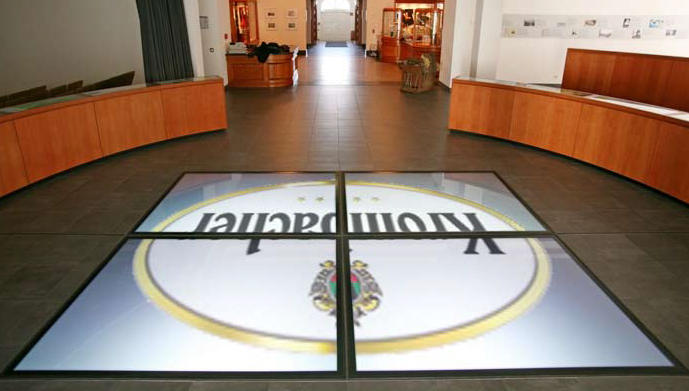 The company’s aim with the overhauled visitor centre and its unique projection system was to make it an even more appealing environment in order to increase the numbers of customers to the attraction and in the process convert them into advocates of the brewery, thereby helping build the Krombacher brand. It has achieved great success so far as the centre is attracting 78,000 visitors per year compared with the previous 30,000. The space is also increasingly used for internal brewery events such as employee briefings, meetings and product presentations to its sales Auditorium used for corporate movie projection to visitors and internal personnel. PT-D5500 successor model is PT-DX610. To know more about our Projector Installation range click here.